Here's our collection of horse printables for children - all sorts of printable fun for a farm topic or for Chinese New Year of the Horse, perhaps. Here's a fun printable sheet for younger kids which not only tests their powers of observation and ability to follow instructions, but also provides practise at drawing and a colouring picture, too! Our cute foal looks like he's still wobbly on those legs. Our horse and foal poster will delight horse lovers. Why not print and frame for a bedroom wall? What animal lives in a stable? Why a horse of course. 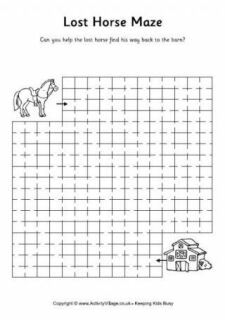 Our simple horse and stable poster is one of set for children learning about farm animal homes. Print and fold this little horse booklet and use it to store facts about this lovely animal - or possibly for Year of the Horse. You will need our origami booklet instructions to fold this booklet. You can use our horse booklet to store all your facts and research about horses, or perhaps to write about a horseriding adventure? Click here for our booklet folding guide. Here's a fun set of bookmarks to print and cut out. There's space to write your child's name or a message, or perhaps some facts about Year of the Horse. Laminate if you like, to make them last. Print this cute horse jigsaw, cut it up using one of our printable cutting guides appropriate to your child's age, then put it back together again! Fun for a farm theme. You will need our jigsaw instructions and cutting guides. One of many printable animal jigsaws for kids, this horse is fun to print, cut out and reassemble, whether for a farmyard theme, Chinese New Year of the Horse or just for horse lovers. You will need our jigsaw instructions and cutting templates. Kids love jokes - and a joke bookmark with these lovely horses on might encourage them to read a book or two, too! Print, cut out and enjoy. Let your thread take a ride around the outline of this lovely horse lacing card. Tailor the difficulty to suit your child by varying the size and space of the holes. Wool and blunt needles are great for youngsters. Older children can try smaller needles and embroidery thread. Print onto card, then cut out this lovely horse mask for kids to use for dressing up, shows and parades. Make a playdough horse to live in the lovely stable on our playdough mat. You can laminate the page if you wish to reuse it. Here's a cute cartoon horse (or pony) that you can print to display - it's designed to appeal to younger kids! The kids will love this poster of a friendly looking horse! Here's a poster of a stunning horse, great for animal-themed classroom displays. For the best results print using borderless printer settings. Just print and fold this pretty card, which is sure to appeal to horse lovers! Use your printer's borderless settings and good quality card or paper for the best result. I think the illustration on this lovely horse riding poster sums up the very special bond which exists between a girl and her horse. It may be a little ink-intensive to print, but would make a super poster or framed picture for a horse-lovers bedroom. Our horse scene poster shows a beautiful white horse in a stable. Perfect for the bedroom wall of a pony lover. This lovely horse template can be used in many different ways. How about tracing it, or colouring it in? You could use it to cut horse shapes out of paper or fabric for some simple collage or applique. The larger sizes would be nice as a writing frame for some horse-inspired writing, perhaps? Here's a lovely outline template of a gentle horse. Use it for scrapbooking, crafts, applique, classroom projects or as a writing frame. This horse template has a lovely, vibrant shape and might be useful for craft or classroom projects. Perhaps you could use it for a writing activity, with the finished horses prancing around the classrom in a row? This pretty horse writing paper will appeal to horse fans and makes great stationery for thank you letters - or for writing a horse story, perhaps. The lovely horses on this writing paper should encourage the kids to put pen to paper - whether for a letter, writing about a horse ride or for their own story. Three versions available below. Equestrian events were a huge hit at the last Olympics and are becoming increasingly popular around the world, but of course children - especially girls - have loved riding and horses forever. Here's a fun way for kids to learn to draw their own picture of an equestrian or horse rider. This pretty card is sure to appeal to little girls, with its gorgeous pony and heart background. Just print onto good quality card or paper, and fold in half. For best results use the borderless settings on your printer. This pretty poster features a gorgeous pony, placed a background of pale pink and lavender hearts - perfect for a little girl's room! These bright stripy horses come in six different sizes. Print onto card, cut out (and laminate if you wish), then use them for counting, sorting into size order etc.